A Tory MP has visited a city garden centre that has helped 100,000 people in one of the most deprived parts of Britain. 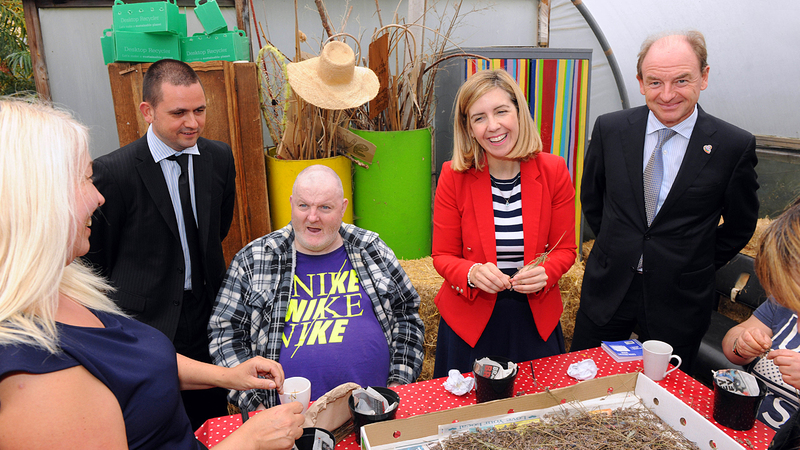 Andrea Jenkyns, MP for Morley and Outwood in West Yorkshire, helped service users grow lavender bushes at Hulme Community Garden Centre in inner-city Manchester. HCGC has been awarded £44,077 using money raised by HealthForm CIC through The Health Lottery. The money is to help local people in inner-city Hulme with a project called 'A Place to Call Your Own'. The garden centre is used by people in social housing as well as people with drug, alcohol and mental health problems. Manager Rachel Summerscales, 43, said: "The funding has helped enormously so we can support and benefit local people who live in social housing who have no gardens. "We show them how to grow plants and put them in things like shopping trolleys. "It just relives stress in their lives and helps show them how to grow their own to reduce food poverty. "People with severe mental health issues get all sorts of benefits and it stops them feeling so isolated." The centre is a green oasis surrounded by tower blocks and social housing. Miss Jenkyns, who is a member of the Health Select Committee, said: "I have just left the Tory Party Conference and I can feel the stress and tension just fall off me. "It is just so peaceful here and I feel so relaxed. "The centre does so much good work that I just wish there were more of them around the country. "I could do with some tips as I tend to kill off all my plants." Martin Ellice, Group Joint Managing Director of the Health Lottery, stressed that this is one of 1,800 charity projects that have been funded using money raised through The Health Lottery. A total of £70 million has been raised benefiting 350,000 people. Mr Ellice said: "The projects are all about helping people to live longer and improving their lives. "It is about local charities helping their communities. "This garden centre really benefits people living in this community to experience a wonderful green space."